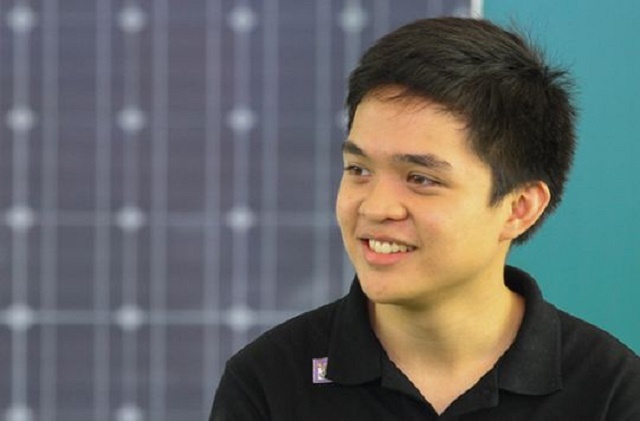 See how Senator Loren Legarda’s son is changing the game through his solar energy company Solar Philippines, thus landing him on Forbes' 30 Under 30 Asia maiden list. At 22-years-old, Leandro Leviste has already figured out he did not want to follow family tradition and enter politics. “There are only three occasions where young people can reach the pinnacle: sports, show business, and business,” he said. The Yale graduate chose entrepreneurship because he felt it would do the most good, and Solar Philippines seemed the ideal setup in a country plagued by inefficient power generation. “The Philippines is the most attractive solar market in the world; there’s nowhere else where electricity rates are this high,” he added. And for such efforts he was one among the 300 young leaders, innovators, entrepreneurs included on Forbes’ 30 Under 30 Asia inaugural list that was released on February 25. In a sunrise industry, his youth is not a handicap. “If we were getting into the construction business, there are so many incumbent players, we would not be able to compete. Why go for a 1-year-old company with no track record run by a 21- or 22-year-old?” said Leviste, who took inspiration from maverick entrepreneur Elon Musk who chairs SolarCity, which fully finances solar panel projects, selling power to the client over 25 years instead of the system upfront. 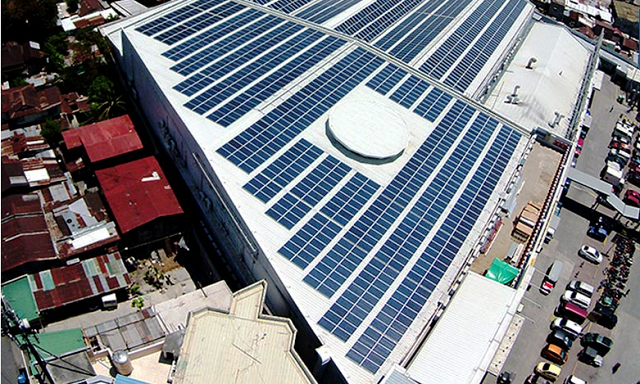 He made a bold move by brokering his first rooftop project, producing about 700 kilowatts (KW), at the Central Mall in Biñan, Laguna, financed through a P40-million (term loan from the Bank of the Philippine Islands. “Malls are strategic because of the foot traffic—that’s natural advertising. 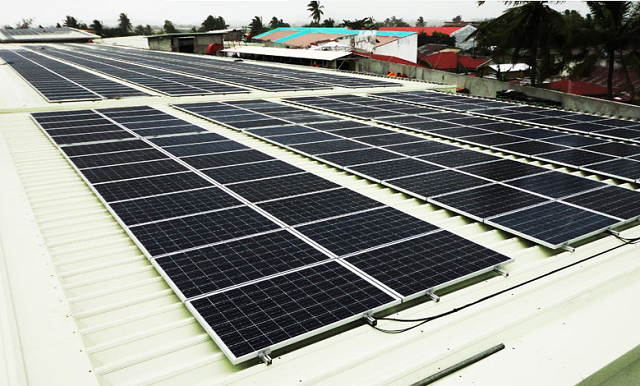 And the load profile of a mall also suits the hours of production of a solar panel,” says Leviste. CityMall Roxas followed suit (650 KW); and then came their first projects capable of producing over one megawatt: SM North EDSA (1.5 MW), and Robinsons Land Corporation (1.2 MW). 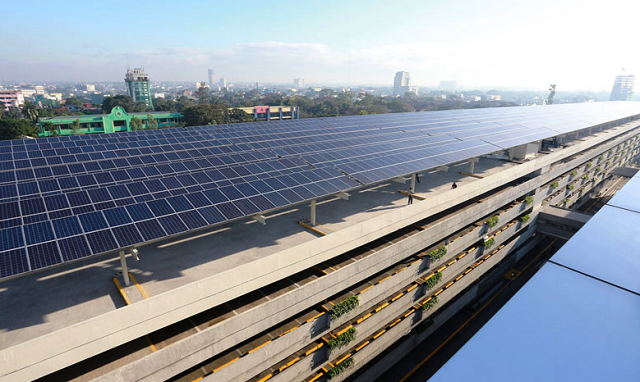 All of the mall rooftop projects are able to augment power supply by 30% to 40%, which translates to savings. Any excess power can also be sold back to the national grid. In fact, SM North EDSA is designed to export all of its power to the Luzon grid. Solar Philippines currently offers a pay-what-you-save arrangement, where clients can avail up to a 25-year contract at a lower power rate (for substantial savings), or a 10-year contract at a higher rate (for faster amortization). “Ten years, you’re paying us what you’re saving [on power], at zero upfront costs. And after 10 years, you have this P100-million investment for free. Twenty years later, free electricity. 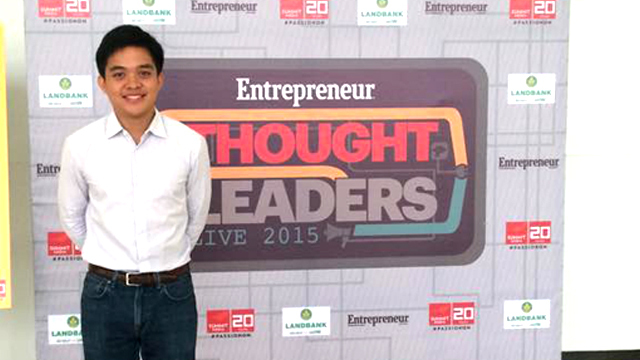 The economics will only become more attractive as the years go by,” Leviste explained. Moving forward, Solar Philippines is currently focused on building solar farms that can sell power to the grid, right off the bat. In the pipeline are three solar farms to be completed within the first quarter of 2016, taking advantage of the Department of Energy’s feed-in tariff incentive, which will allow power generators to sell to the grid at a guaranteed rate for 20 years. “There’s a gold rush of investors chasing after this feed-in tariff right now, and we’re looking to complete no less than 200 MW: 60 MW in Calatagan, 95 MW in Tarlac, and 45 MW in Cagayan de Oro,” he shared. Their combined output covers half of Luzon’s entire power deficit. Companies developing solar rooftops with Solar Philippines are also partnering up for solar farm development, said Leviste. He admitted that the best way for his company to scale up the rooftop business is to focus on the solar farms, which also have a longer-term agreement of 30 years. He said that solar rooftop business will take a lot of equity, and the fastest way for his company to raise that capital and increase customer base is to do what is at larger scale, and that is the solar farms. That said, Leviste is ensuring that the rooftop projects continue to grow, whether for malls and factories, or for residential homes. “We want to make power as cheap as possible in the Philippines… by installing solar power on rooftops, or by selling them cheap electricity from the grid,” he said. Leviste forecasts that there will soon be a massive grid defection as more efficient solar panels will combine with energy storage, which translates to not just offsetting noontime load but supplying 24/7 electricity. “Even right now, given present-day battery prices and solar prices, you have a lower-level cost of electricity from solar with batteries, than you would from the P12-P13 per kilowatt hour that you’re paying Meralco,” he points out. Given that demand for batteries will continue, particularly with the influx of e-vehicles into the country, he is seriously looking into the possibility of manufacturing these batteries as a natural extension of the business. Leviste observes that people underestimate the potential of solar energy which is why it is taken so long for the incumbents to move into the segment. He has proven that large-scale projects are viable, despite the large capital requirements—for example, on a solar farm project, installation cost is at $2 million per megawatt. While others are still studying solar, he is already getting into the best position he can. “It all begins with your assumption of the market. If you think that solar is a marginal piece of the energy mix, then that would cascade into your business plan being one to maximize profit while you can. Or make money out of the current feed-in tariff subsidy while you can,” he said.